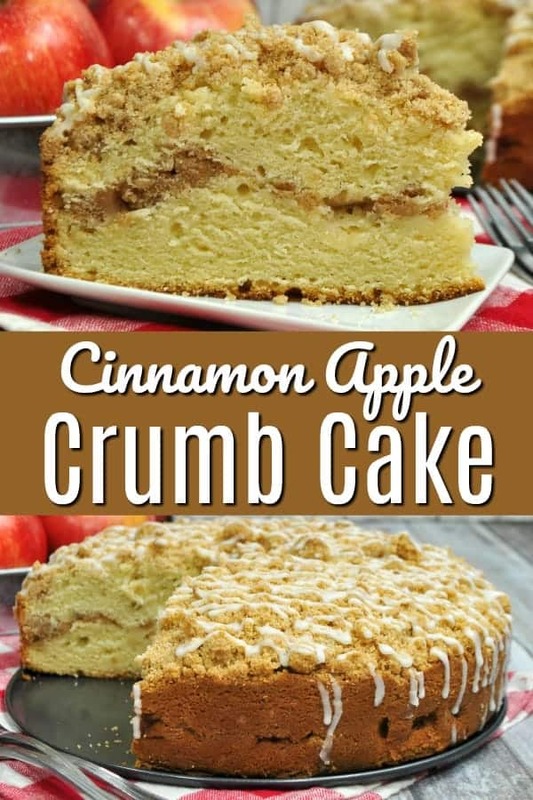 Warm Cinnamon Apple Crumb Cake with a layer of cinnamon apple filling, topped with a crunchy streusel crumble and drizzled with a delicious glaze. Perfect with a warm cup of coffee or as a special breakfast treat. Fall desserts warm my heart and soul! Some of our other favorite fall recipes are our Caramel Apple Crisp Bites and our Pumpkin Spice Muffins. 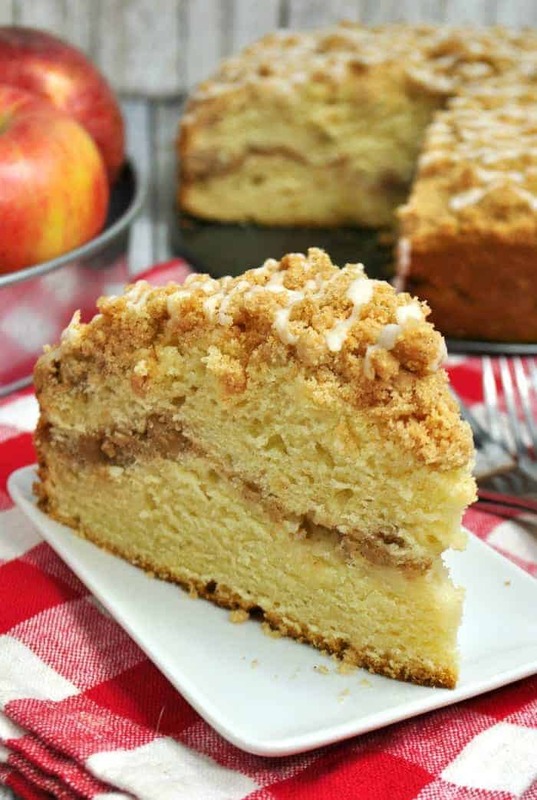 Cinnamon Apple Crumb Cake will not only fill your belly with a delicious Fall dessert, but it will also fill your house with the most amazing aromas ever. 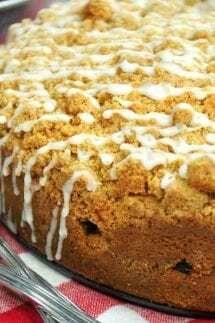 This easy crumb cake recipe makes the perfect Christmas morning breakfast or Thanksgiving dessert. It is so yummy that your guests will be begging you for the recipe! 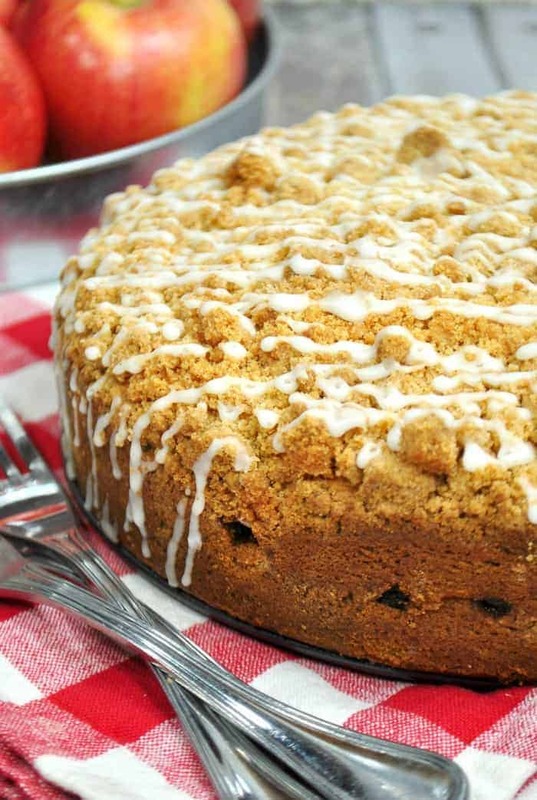 Coffee cake is one of my favorite things ever. “Why”, you ask? (I mean come on, do you really need to ask why?) 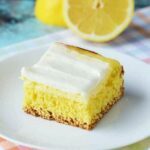 Let me tell you why….. you take a few of my favorite indulgences… a hot cup of coffee, a warm piece of coffee cake that has a hint of cinnamon, some crunchy crumb topping and a layer of deliciousness in the center. Then, if the stars are aligned in my world, it is a crisp and cool fall afternoon, the house is quiet, the laundry is done, the dishwasher is empty and I sit at my kitchen table with my extra hot cup of coffee and a warm slice of my cinnamon apple crumb cake in front of me and, at that very moment….all is good in my world. That’s right…. all I need for me to get to my happy place is a clean house, a cup of coffee and a delicious dessert! 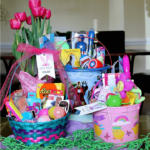 It’s the simple pleasures in life that can make going into a hectic afternoon of carpools and homework and kids activities, just a little bit easier! Back to the Apple Crumb Cake! Let’s be honest, the best thing about crumb cake is the crumble, right. That is why we have our cinnamon crumble not only on top of the the apple cake, but there is a layer right in the middle too! 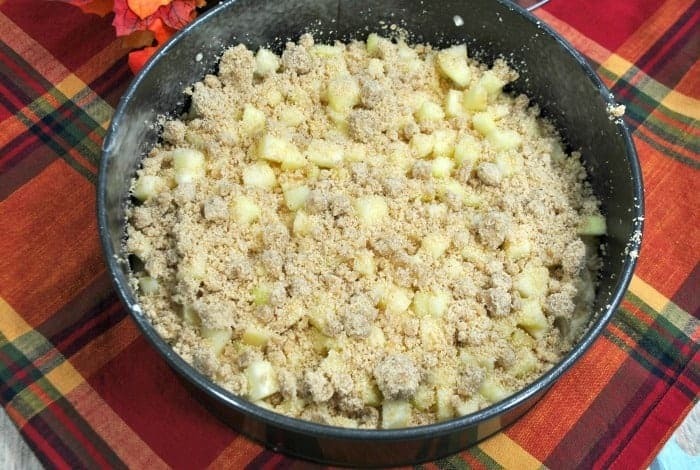 So, basically, what we are doing here is placing a layer of our cake batter in our pan, adding the chunks of diced apples, covering that with half of our streusel. Then we are covering that streusel layer with the rest of our cake batter and the remaining crumb topping! Once the cake is baked and cooled, we will drizzle it with our delicious Cinnamon Apple Glaze Drizzle and, there you have it, a deliciously simple fall dessert! Use a springform pan, trust me, it will make your cake making life so much happier! IF, you don’t have one, you can use a 9×13 or any other cake pan! The springform pans just make it so much easier to remove the cake! To tell if your cake is done, bake until a clean knife or toothpick is inserted into the center of the cake and comes out clean. When baking your cake, if the top is browning too fast, just tent it with some tin foil. In a medium bowl, whisk together the flour, baking soda, salt and baking powder until combined. Allow to cool completely on the counter before removing springform pan. Note: run your knife around the edge to loosen things up a bit before removing the pan. Drizzle onto the cooled cake and enjoy! Looks like a delicious recipe. However, I’ve never heard of ‘sweet cream butter’. Can you tell me what it is, please? This sounds incredibly delicious!! I can’t wait to try this recipe!! This cake is out of the park delicious – we devoured it! Loved this delicious crumb cake! What a perfect way to use up our fall apples we picked. Delicious!